Atlanta. The big city. With world-renowned attractions like the Coca-Cola Factory, the Martin Luther King Jr. Memorial, and the Mercedes-Benz Stadium in our concrete backyard, we navigate a city of wonders. Whether we’re rushing by skyscrapers on our way to class, or awakened by Grady Hospital ambulances’ blaring sirens piercing through our snoozes, or yelling at the next commuter student trying to cut us off, there’s one thing certain about a college student’s life in the city: it’s fast-paced, loud and stressful. While strolling around new and old buildings and enjoying the Downtown excitement can be a thrill, sometimes we all need a break from the rush. And we’ve compiled a list of the best places to take a breather around the city, for when you find it’s time for that break. Art and nature lovers alike can take a mind-clearing field-trip just 15 minutes from campus to enjoy a botany spectacle, listed as one of the greatest experience’s Atlanta has to offer. The Indoor Collection includes the Fuqua Orchid Center and Fuqua Conservatory plants. Just walking through the Orchid Display House of the Fuqua Orchid Center, you see an entrancing array of colorful orchids that invite you deeper into the orchid oasis. The High Elevation House of the Orchid Center stops you in your tracks with a majestic waterfall enchanted with orchids native to the Andes Mountains of South America. This is just the beginning of the experience. The Outdoor Collection boasts a rose garden, hydrangeas, and a beautiful Edible Garden that will put your grandmother to shame. The exhibits change on occasion, but the amazement lasts all year. With more sights than we have space to name and the Earth Goddess (a botanical beauty you have to experience!) beckoning you there, the Atlanta Botanical Gardens is the perfect place for a relaxation of the mind and stimulation of the senses. Lullwater Park and all its soothing glory graces Emory’s Atlanta campus, with a breathtaking stretch of more than 150 acres of natural relief comforts. A paradise of high trees, pristine water and cushioned greenery invites students to forget all about the grey-themed city for a while. 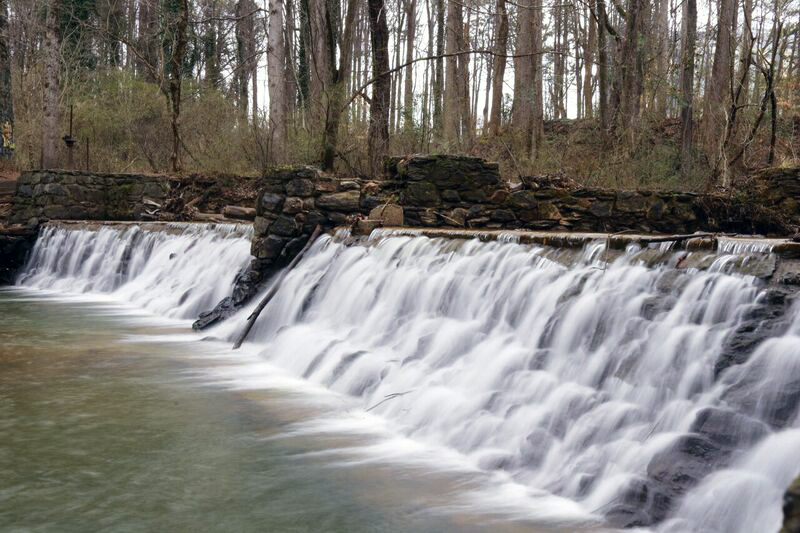 Candler Lake, centrally located in the park, attracts all weary students into its splashing seduction under the waterfall as they take a jog or just stroll through for some peace of mind. The running trails send you past views so captivating, you’ll want to keep your pace slow just to take in the view. You can even take in the scenery when you cross over the bridge that leads to a power house that was once fueled by the running water. The stone building opens to a clear blue sky not blocked by a plain of towering windows, and you can feel the history of architecture dating back to the 1920’s behind the aged walls. With wildlife nestled in the pockets of this forested retreat, you can take a mental load off with the permanent residents of the park to enjoy a moment of ease. The Chattahoochee River is, of course, a great destination to let your stresses float away with the water, but the wildlife is what really sets it apart. It houses more species than any other stop on our list. 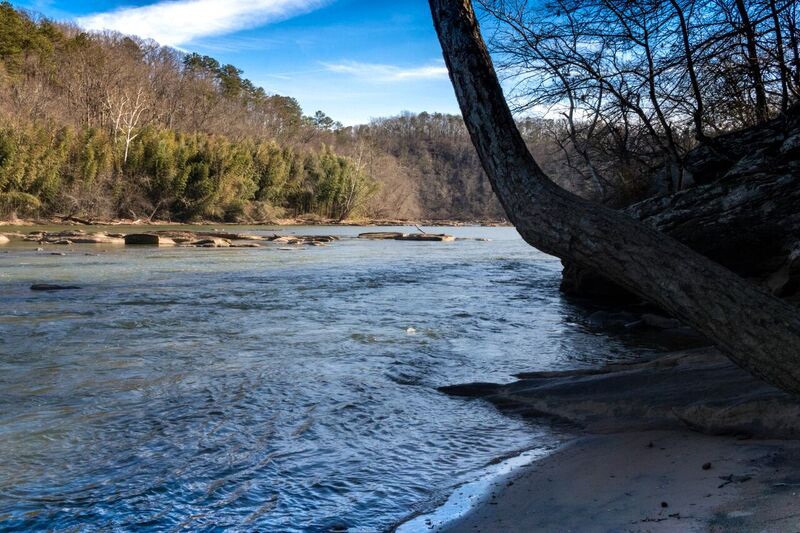 Firstly, swimming in the Chattahoochee River are more than 20 species of fish. And when it’s not fish swimming by, you may spot a frog, newt, or salamander making its way through the water. On the land, you can find a huge array of mammals scurrying around like shrews, otters, and beaver, just to name a few. Even as you look in the sky, you can see Cardinals, Woodpeckers, and Blue Jays by day, while the owls start soaring at night. You’ll get to enjoy the soothing sounds of the river with all of those animals right in sight. Speaking of the sights, the plant life near the river adds to the experience as well. The rich earth around the river allows for plants like lilies, redbuds and other species depending on the season. Spring might bring azaleas, while summer might bring goldenrod. No matter what time of year, though, the river offers a natural overdose to keep your senses alive after having them dulled all semester long. With the water flowing and the natural sounds of the wildlife, maybe find a good spot to settle down and meditate to clear your mind. 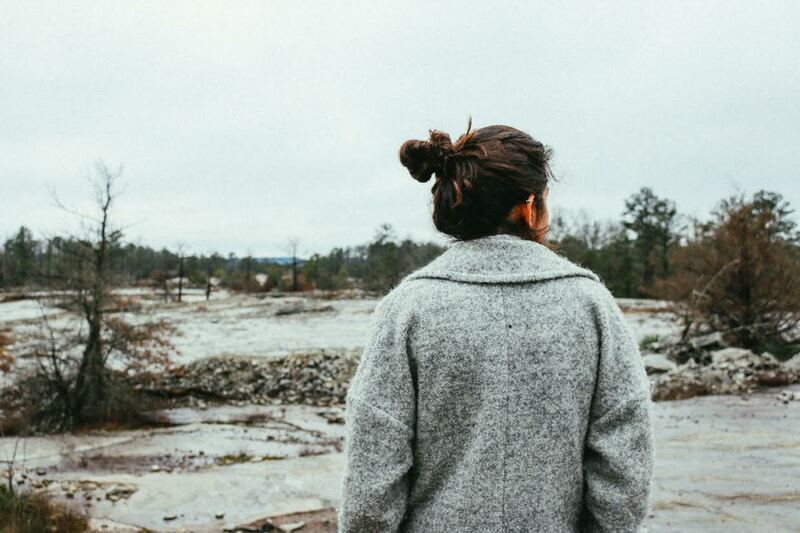 The Arabia Mountain National Heritage Area is a great place to clear your mind of the history you’ve been reading all semester, and fill it with history that won’t bring your GPA down, paired with nature you won’t find anywhere else near us. Fun fact: the mountain isn’t actually a mountain. It’s a monadnock, which is just an isolated, elevated stone mass surrounded by a flat plain. Allowing for geographic features that house rare plant and animal species, the monadnocks are such a unique feature to visit. Along with the monadnocks, the sea of open green and rustic fixtures gives visitors just a small insight into the history behind the area. For one, the landscape in the past lent itself to the people there to live off of. Immigrants, freed slaves, traders, and settlers all used the rich land for ways of living. Maybe the most prominent feature is the granite found at the park. Rock cutters, traders, and people who built with the granite used the natural merits of the land to make a life in an area that would hold on to its history until present day. Take a trip with friends here to learn about Arabia Mountain, bike around, or go on a walking tour to get your mind off of the city stresses. In Midtown’s Morningside neighborhood lies a nature adventure for city dwellers who also like to take a breath of fresh air in their spare time. Acres of trails made for hiking, running, and biking await any college student as they drown in exams needing to wash up on a woodland wonderland. In the eye of the storm of Midtown, you can explore the land and water that is tucked right in the chaos. South Fork Peachtree Creek offers a serene scene laced with green as it curves through the trees creating a natural peace unmatched in a city this big. Spanning over the water is a bridge worthy of any outdoor connoisseur’s Instagram as they continue into their voyage. Challenging the urban life around it, Morningside Nature Preserve is a hidden gem in Midtown that’s sure to help you forget your troubles. Even better, it’s also known fondly as “dog beach” for those students who have a furry friend who’s down to share the shore with other beach barkers. So grab some of your friends along with their dogs and you’ll leave so relaxed that you won’t even mind how wet your car is after the pups shake themselves dry on the way back. Birds chirping, the sound of running creek water, and an outdoor auditorium. These are all things you can expect from Cascade Springs Nature Preserve. Even back to around the mid-1900’s, people knew the isolated meditation this quiet forest could offer. As the site of a Civil War battle, the Cascade Springs water was still sold with the faith of its revitalizing properties in mind. It was revitalizing then, and it still is now. Students can enjoy more healing hikes where soldiers were once wounded in fights. Little nuggets of history still exist there such as weathered stone buildings and the slope of the landscape over time as water cascaded down the terrain. Moss decorates the spring houses and tree limbs that have seen more days than we can imagine. The simplicity and comfort of the natural aging of the park’s features invites tightly-wound students to take a breather as they travel through the forest at their leisure. You’re bound to run into a deer or two, and it’ll just be all the more distracting from the fact that the oasis is almost over after your well-deserved rest. It’s important to remember places like these when you get stressed and need to take a breather from being on “go” all week long. I’d say the Atlanta Botanical Gardens and the Chattahoochee River are my two favorite places to really detox the high-strung energy. Wherever you decide to go, just remember, mental stress has physical consequences, so take this time when you need it.